True Blue Beach has a beautiful view at the sea. You see the islands and the sailing boats from KalamÄ±ÅŸ Marina and you can watch a beautifull sunset. 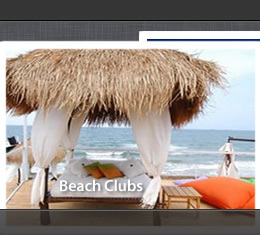 True Blue has a nice sandy beach, swimming pool, excelent restaurant and bar with live performances. In the middle of the garden the is a nice Bar which serves good cocktails. True Blue is one of the most popular beaches in Istanbul and during the summer there are concerts and live events. This summer True Blue has seen some of the biggest stars such as Katy Perry who preformed live in July 2009 at True Blue beach. 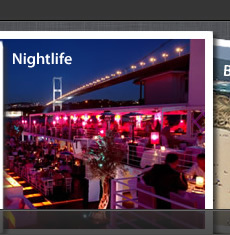 True Blue is the most popular beach club in Istanbul, with elite interior design, unique sea view and ambitious menu. 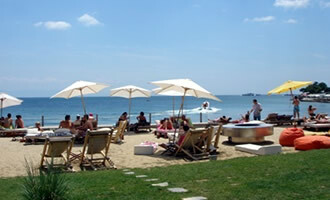 Restaurant, cafe-bar and beach concept of True Blue, Istanbul’s oldest summer venue brings back the beach atmosphere. The True Blue of the sea on every side, interior decoration with open air places with summer TÃ¼rkbÃ¼kÃ¼ style. On Sunday morning it’s breakfast time … A beautiful and relaxing weekend. You will remember the Trueblue’s atmosphere. The location of open buffet breakfast every Sunday. The restaurant’s menu is Mediterranean and very rich from the Ottoman-Turkish cuisine. True Blue has an indoor space with a capacity of 200 people, a private beach and pool for guests and much more. True Blue is open on Friday and Saturday 9.00-04.00, other days between 09.00-02.00. Credit cards are valid.